At the April monthly meeting the President announced that this year was the 25th anniversary of the formation of the club. It was suggested that the club hold an exhibition over the weekend 10 – 11 November with a dinner to which all members and their partners would be invited at the Ellerslie racecourse to commemorate the occasion. The exhibition venue was a long building with doors at both ends which was ideal for a through flow for the public. The floor was carpeted with a row of stands on both sides parts of which were either two of three tiers high, dispersed with several small shrubs in containers, and some well padded seats. Friday was the set up day for the exhibition items and outside there were two up and back portable tracks and a circular ground level track lent to the club by the Rotorua Society of Model Engineers. The Scale Marine Modellers (“SMM”) had their portable pool assembled close by. By the end of the day all the shelves were filled up, indeed the boat club had to line their models up diagonally cheek by jowl to fit the 53 models in the allocated space. One of the model aircraft clubs, the Aviation Country Club, hung several aircraft from the ceiling and a ¼ scale Spitfire was in the middle of a display stand. There was no doubt that the club members had responded to the call as the display stands were packed with a range of magnificent models. Come Saturday morning the public starting to pour through the display hall. Keith Bankart had his Kb in steam ready for the non-stop stream of passengers and the SMM were sailing several radio controlled models around the pool. The total count of models was 212 which included the following; 76 locomotives 23 of which were under construction, 6 traction engines, 23 workshop items including machines and tools, two internal combustion engines, 11 clocks of a very high standard, 34 steam engines of one sort or another including several other models, 53 scale model boats most of which were radio controlled and 7 aircraft. On Saturday evening a large crowd gathered on the fifth floor of the racecourse complex for drinks and a natter before Peter Hough escorted the happy throng down one floor to enjoy an excellent dinner. Jim Ellis was the master of ceremonies for the night and after the dinner and during the toasts the founding members of the club were asked to stand up to be recognized; these included Basil Wilson, Dave Watts, Arthur Perryman, Phil Isaac, Gib Gane, Harry Frost, Jack Rennie and Guy and Jack Hocking. Peter Anderson, ex president and editor, then gave a good address and traced the clubs fortunes in tandem with his own experience as a member. Gerry Gerrard then replied on the behalf of the visiting clubs and as to be expected his remarks went down very well. So after much reminiscing and discussion between the members and friends the night drew to a close after celebrating the 25th anniversary of the Auckland Society of Model Engineers. In early 1986 the committee discussed funding for the track extension. Murray Lane suggested raising funds by holding an exhibition – to be the biggest and best show held in New Zealand. The committee agreed with this idea and appointed Murray as convenor. Seed funding was provided by a $2,000 loan from the New Plymouth Society of Model & Experimental Engineers. The University of Auckland Recreation Centre in Symonds Street was chosen as the venue since it was centrally located and had three adequately sized spaces plus an office. Many members cooperated in the preparations including Jim Mowat, who arranged for the commercial stands, and Brian Beal, who prepared the advertising material. The cost of hiring suitable tables was high so the Tuesday Club built these from pallet timber to a Jim Greasley design and Grant Anderson arranged for the tables to be transported to the venue. They were sold for a small profit after the show. Miniature candlestick holders and air-brushes were to be made and sold at the show so a number of these were machined in advance by Dave Watts and Peter Swager. On Saturday many members helped to assemble the display tables around the main hall and four parallel rows running down the middle. Smaller tables were assembled in the martial arts room and the SMM assembled their portable display stands in the room on the mezzanine floor. On Sunday morning the stands were completed and covered with white cloths, with astro-grass and scale tracks on the stands for the locomotives and rolling stock. Sunday afternoon was a hectic time devoted to bringing the models into the centre and placing them in the required positions with descriptive cards hand-written by Mike Jack; the trade stands were set up on the mezzanine floor. All was spick and span on the Monday morning and the exhibition was officially opened by Dame Cath Tizard, the Mayor of Auckland in the early afternoon. Patronage was poor early in the week but it was bedlam on Friday night when the school holidays started and on Saturday and Sunday when tremendous crowds arrived. The New Plymouth SMEE, Manukau Live Steamers, Scale Marine Modelers and the Auckland Model Aero Club supported ASME with display items; there were a total of 454 items on display. Two schools helped by providing a number of small metalwork items made as a part of the school curriculum. Four of the stands in the main hall were used for the locomotive display arranged so that each engine could be seen in detail, while on one of the stands against the wall above the models a number of original Peter Baker paintings were displayed. The small stationary engines were placed in an area supplied with air and a number of these ran throughout the exhibition. The internal combustion (“ic”) engines and aircraft engines were also grouped together. A workshop area was set up in a corner where the public could watch members operating some of the machines. The Auckland Model Aero Club (“AMAC”) had several aircraft hanging from the ceiling. In the martial arts room next to the main hall, models of the older type: locomotives, clocks, ic engines, machine tools and smaller traction engines were displayed; there were also some older stationary steam engines that were running on air. 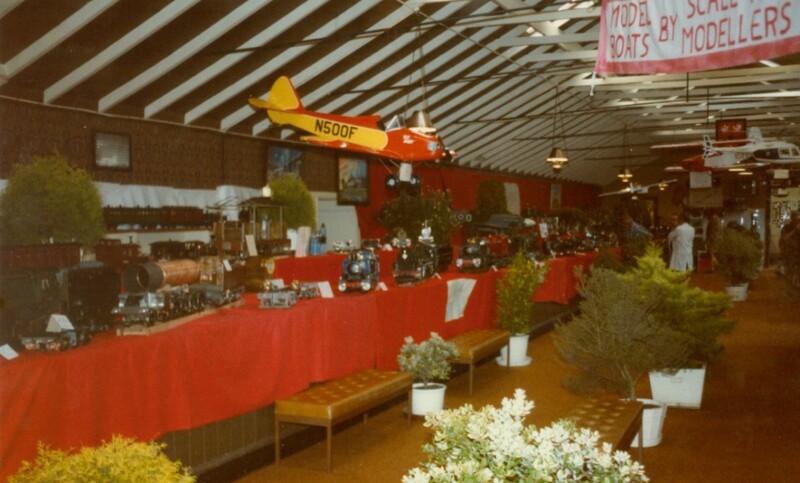 The displays included the following; 87 5” gauge locomotives and 33 3½” gauge locomotives, a total of 120 of which 58 were completed. There were 88 boats in the SMM stand, 9 aircraft from AMAC, 13 ic engines, 9 traction engines, 63 stationary steam engines, 15 clocks, 21 workshop machines, 76 tools and attachments 21 Peter Baker paintings and 16 miscellaneous items. 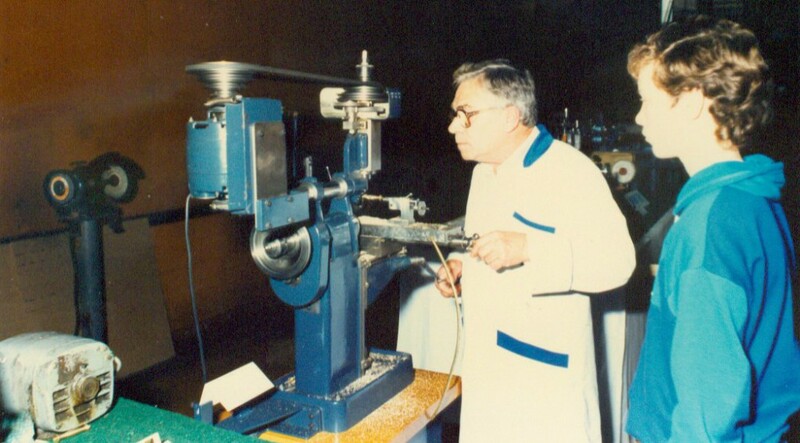 Club president Jim McLean was kept busy demonstrating the air-brushes while Dave Watts and several others made candlesticks on a small horizontal and vertical milling machine built by Dave. Most of the candlesticks made were sold. Outside several teams kept the children happy with rides on the portable track and Peter le Gros ran his Locomobile on Sunday afternoon. The SMM had their portable pond set up and were sailing boats most of the time. A small room on the mezzanine floor was used as an office by exhibition manager Murray Lane. This room was also used as a smoke and lunch room for the many stewards who were operating on a roster system. A dinner was held at the University cafeteria on the Saturday night attended by 56 members and their partners. As far as is known this exhibition is the largest of its kind held in New Zealand and was appreciated by the large number of visitors who went away well satisfied. For some months the suggestion of celebrating the club’s 40th anniversary had been bandied about and became a certainty in April 1999, when Bill Lovell and Bill Parker volunteered to organise it. After looking at several venues, one of the buildings at the Greenlane show complex was chosen and the date for the exhibition was to be the 30-31 October 1999. These two gents spent the next six months getting everything together for the event. Support from members was rather slow in the beginning but the pace hotted up nearer show time, and members started to respond with greater enthusiasm. When the team of club members first arrived at the venue on Friday 29 October, they were met with a vast cavern of bare concrete. However in a short time, heavy duty shelves were erected and with the help of Dave Giles’s forklift extra lights were hung from the ceiling. The SMM had set up their portable pool adjacent to their display of boats. Trailers were arriving throughout the afternoon with all the larger models including locomotives from Manukau Live Steamers. After a slow start models started pouring in and these were mounted in the appropriate positions. The last of workers did not get away until quite late that night. 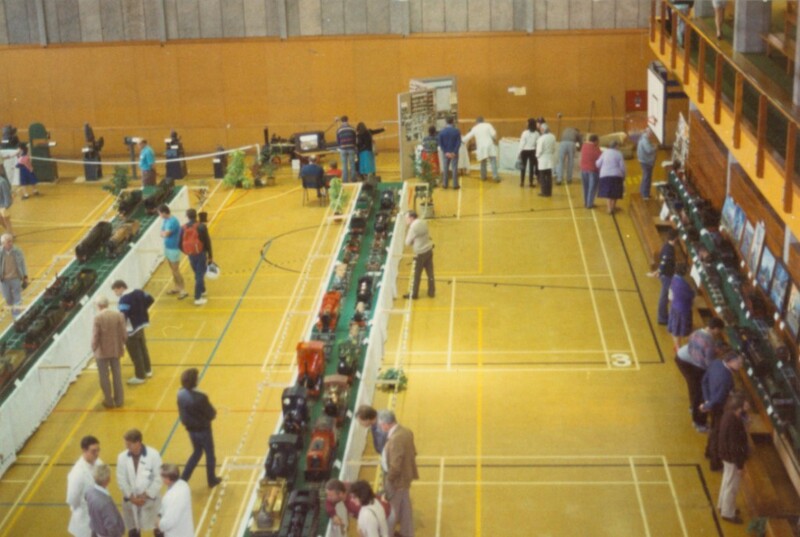 It was all go on the Saturday morning with the hall full of models, machinery, railways, etc. As well as contributions from the above clubs, there were the following; New Plymouth Society Model and Experimental Engineers stand, Palmerston North Model Engineers stand, Auckland Steam Society entries, MBM Supplies stand, Rotorua Model Engineers stand, Auckland 9MM (O gauge) Club with a large layout of NZR trains, Metropolitan Railway Club (HO gauge) layout, Auckland Model Aero Club with mostly old time aircraft and Fred Putt’s stand with slot cars. Chevpac Machinery had several machines on display as did McDonald Machinery with smaller displays for Trade Tools and Herbert Machine Tools all aiming at the home workshop market, and a stand selling plastic kitset models. Joan Clark the secretary of the SMM was a member of the Auckland Doll and Collectors Club and they had a stand with examples of their work, which was of interest to the women folk who came to the exhibition. These dolls were extraordinary and looked very life like, and were dressed in a large variety of clothes, all of which were handmade. SMM did a great job and displayed some 110 boats with several in action in the pool at any one time. Unfortunately the area given to ASME was rather small; consequently models were all crammed together mounted in a series of shelving up the wall, making it difficult to see the models properly. Many of the models were running on compressed air; this attracts onlookers since a live model is much more interesting to look at than a static one. ASME had a small working workshop in the centre of the hall where several members carried out some machining which attracted a lot of interest from the public. Lunches and morning and afternoon tea for exhibitors was held upstairs in a small cafeteria manned by the ladies under the supervision of Bill’s wife, Dianne Lovell. The food supplied was marvelous and it was nice calm area to relax in after the hustle and bustle of the main hall. Although there was a good crowd in the morning, it started to die away in the afternoon. However the public rallied around on the Sunday and were pouring through the exhibition most of the day keeping all the stands very busy answering questions. On Saturday night around 130 people joined together at Quality Hotel, Logan Park in Campbell Road for a celebratory dinner followed by several speeches. Approximately 2500 people came through the door. After hall hiring fees, shelving, tables, expo hire, extra lighting hire, power and advertising etc., the club made a loss, but it was considered well worthwhile nevertheless. 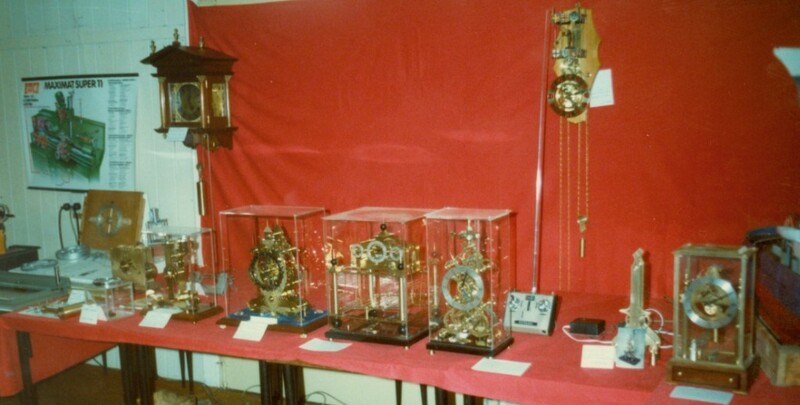 To mark the Society’s 50 year anniversary, it was decided to hold a large exhibition for the public at the Waipuna Hotel and Conference Centre in October 2009. 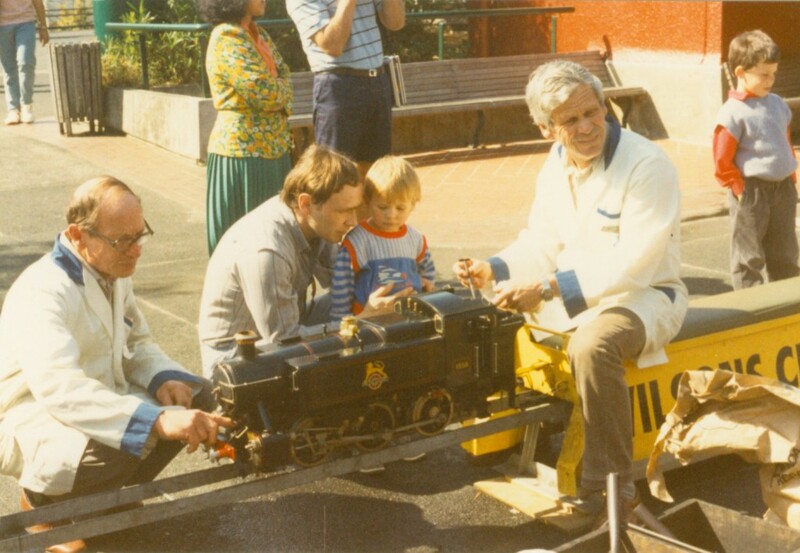 Due to its adjacent location, this enabled ASME to operate trains for visitors, as it is only a short walk away to the Peterson Reserve track. The Exhibition was open for three days and record crowds attended, helped by a comprehensive advertising promotion including, for the first time, the use of television. A Jubilee Dinner was held at the Conference Centre, with many past members and visitors from other model engineering clubs attending. All the events were a huge success.